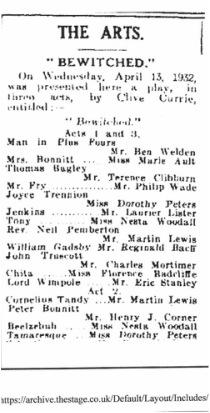 Charles Mortimer appeared as John Truscott, in "Bewitched" at the Arts Theatre, London, from 13 to 17 April, 1932. The play tells the tale of a village rector who becomes obsessed with the picture of a gypsy. From The Era - Wednesday 06 April 1932.